Stepping back a few years, Internet Contribution technology was widely questioned. Questions like “Can I really trust the Internet to deliver live contribution feeds?” were fundamental. Of course, these days we know it works and Internet Contribution technology has certainly proven itself many times over when it comes to both reliability and quality. There has however still been a gap compared to the availability and reliability of high-end media networks, a gap that has been reduced by introducing technologies like link bonding in the past and that is now reduced even further with the latest protection technology, Adaptive Source Protection (ASP). 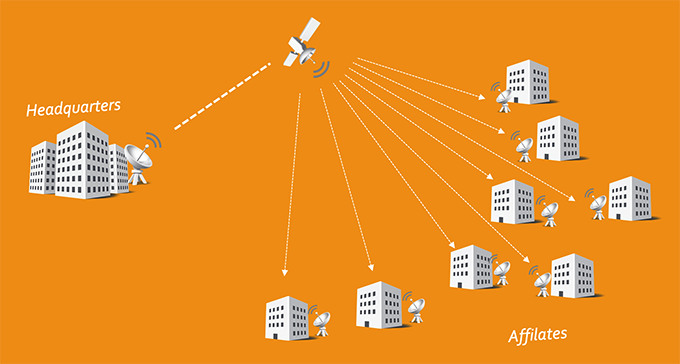 ASP makes it simple to use multiple feeds for protection, using any mix of Internet, Satellite and fiber feeds as well as any other local source for protection. For a long time, the reason we have been looking at Internet delivery for broadcast media has been price. I.e. can we do the same thing we do today, but more cost efficient? By now we know that the advantages are much greater, including bi-directional connectivity, the ability to customize content per receiver and not to mention a much higher degree of reliability. In this article I will focus on the use case of primary & affiliate distribution and how new types of high-reliability functionality, such as source prioritization, can be utilized to build an even greater overall solution. For a long time, the only economically viable solution for a point-to-multipoint distribution was satellite. And while the industry loves to talk about it in terms of replacing Satellite, we at Net Insight always been believers in looking at it from a complementary standpoint. But back to the original question, what are really our options for primary distribution? If we forget about dedicated fiber networks and microwave links for a second, we are left with satellite distribution, and Internet delivery. Now, we could look at this as an either/or question, or we could look at it as a combined solution. It all depends on how safe you want to play it, and how much you trust the primary option. This is pretty much status quo and what we’ve been doing for years. While it’s very high cost to get the content to the transponder, scaling the number of receivers is relatively cheap. All we need is a dish and an IRD. One of the large drawbacks of both dedicated fiber and Internet delivery is that it is a physical wire that can actually break. As satellite is transported in the air it is not sensitive to fiber cuts. Content can be unique for each destination with local advertising etc. This also means we can have different quality for each endpoint depending on the bandwidth that is available at that specific site. Due to its bidirectional nature, each affiliate can also send content back to headquarters (or anywhere else) at a reasonable price point. While it’s typically very costly to scale up quality (e.g. increase bandwidth) on satellite, doing the same thing over the Internet is very competitive from the perspective of price. While it is prone to fiber cuts, it is however not sensitive to different types of weather phenomenon. 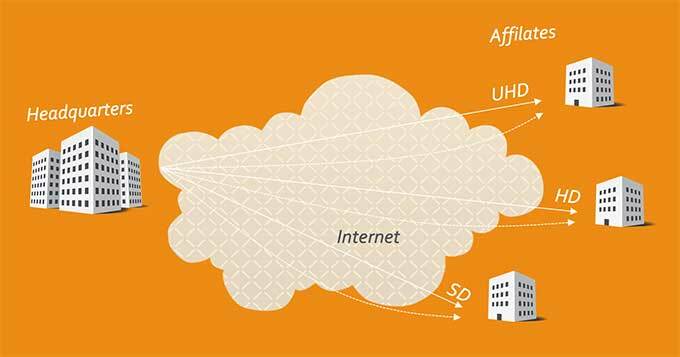 Traditionally, Internet distribution has been a simple unicast feed from one central point to any number of receivers. These days, it is also possible to use link bonding technology to protect the path end to end. You will never be able to guarantee total diversity with the Internet of course, but speaking from experience the issues are almost always in the last mile. Just make sure the two paths in use are as diverse as they can be. Another option is to look at an even more resilient design with an active/active solution and node redundancy utilizing our Adaptive Source Protection (ASP) technology. ASP works by taking a prioritized list of video sources as input and output the best (and highest priority) of these feeds based on the quality of the incoming signal. 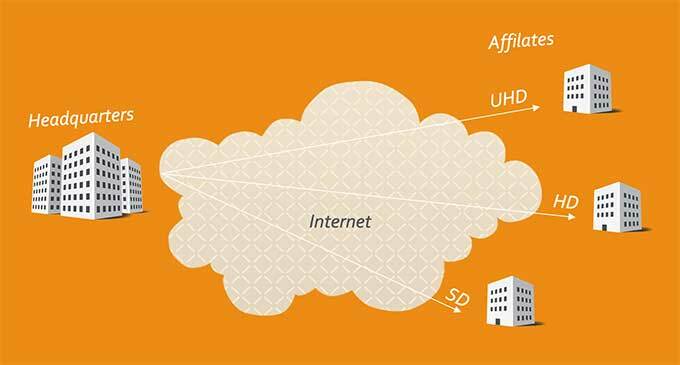 In some cases, the best option might actually be a hybrid solution, leveraging the best of satellite and internet technologies for your primary and affiliate distribution. A best practice configuration we recommend is using a higher quality feed over the Internet (e.g. 10Mbps) and a lower quality feed over Satellite (e.g. 2 Mbps). Again, by utilizing the Adaptive Source Protection technology in the Nimbra VA, we can leverage the Internet feed as a primary link and if that fails or is degraded, simply failover to the backup feed. Of course, that backup feed won’t be as crisp as the primary feed given it’s only 2 Mbps, but it is still a lot better than a black screen. Of course, this can also be paired with all the bells and whistles from above. In the end it just comes down to costs vs benefits. The really great thing about this solution is that for some cost conscious sites it may actually make sense to leave them on that 2 Mbps SD feed. 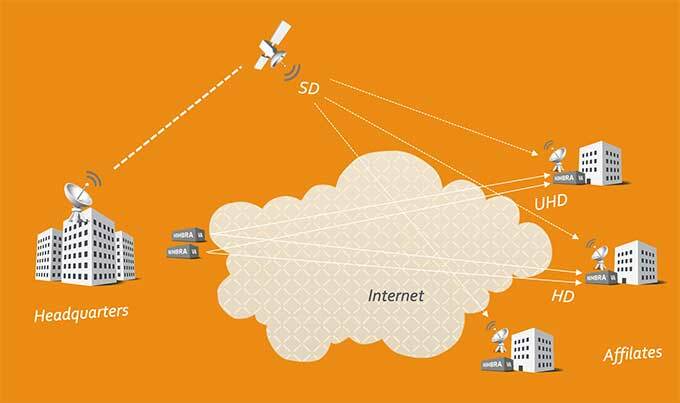 For more important sites however, the satellite feed can be considered a starting point while getting that higher quality Internet feed in place. Ultimately allowing for a much smoother transition journey from Satellite to Internet feeds compared to a hard cut-off date. Side note: If a black screen is not your thing, and keeping a separate satellite solution isn’t either, you can use the same Adaptive Source Protection technology to ingest a backup feed from a local playout server as well. Internet Contribution has truly come a long way since its embrace just 5-10 years ago. Today, it has expanded to be a highly resilient network technology beyond the simple point-to-point architectures available at its birth. While the architecture fundamentally still is point-to-point, or point-to-multipoint, it has expanded its carrier grade capabilities massively beyond those simple use cases and we are now able to protect everything from individual interfaces and the entire node to the path in between. By leveraging the Adaptive Source Protection technology in the Nimbra VA series, we can now build a highly resilient network design utilizing all the technologies we have at our disposal.